This article covers the above three factors in relation to Go-Karts with no suspension, and outlines typical angles and geometry which should be used. The information for this article is taken from “The NatSKA Guide to Karts and Karting” and is currently available on ebay! 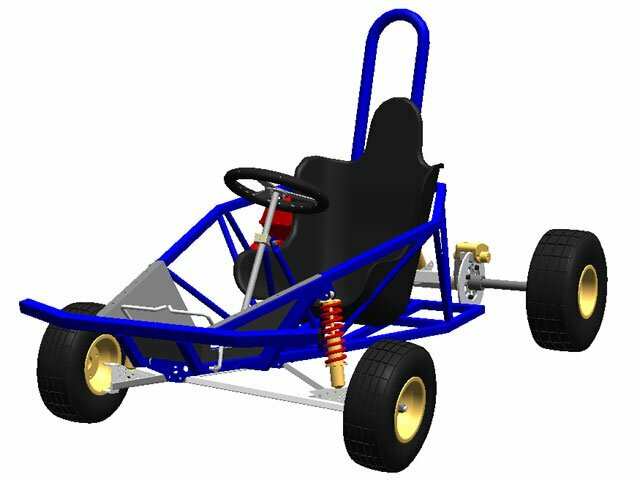 The off-road kart plans, and racing kart plans on this website, take into account these steering geometry angles and match the values in the above Guide. 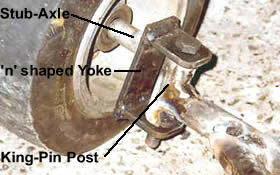 The (1) Stub-Axle, (2) n shaped Yoke, (3) King-Pin Post make up the essential parts of the steering. The King-Pin Post is attached/welded to the chassis. The n shaped Yoke pivots/hinges on the King-Pin Post. The Stub-Axle is attached to the n shaped Yoke. These three parts are welded/attached at various angles to make steering easier on a kart. The practical side/making of these parts are not discussed here, and instead just the theoretical setup. This is the inclination of the King Pin whose top leans in a backwards direction towards the rear of the kart. This is the most important factor governing how the kart will handle. This is however, interrelated with the other angles. 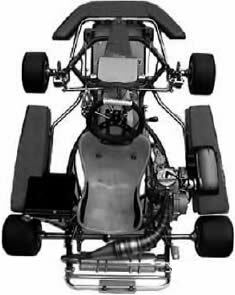 In the case of the King Pin inclination, the greater the angle, the greater the “jacking effect” on the chassis, and the greater the oversteer the kart will develop. If there is too little, the kart will tend to understeer. The greater the angle, the heavier the steering and tendency to self-center. In practice, many people settle for angles between 20 and 25 degrees. This is the inclination inwards at the top of the king pin towards the center of the kart, and it is aimed at counter-acting the jacking effect of the castor: at the same time it helps to produce a stronger joint, which will be able to withstand higher shearing forces. Generally this angle is between 10 degrees and 12 degrees, and to allow the wheels to stand flat on the floor, is offset by a similar angle on the stub axle. This refers to the placement of the steering arms (when viewed from above), in relation to the chassis, and the rear axle. Ideally, lines projected through the center of the King Pins, and through the bolts holding the track rods, should meet at the center point of the rear axle. The effect of this is that the inside wheel always describes a smaller radius arc than the other wheel, when the kart is being turned – this is most especially important at low speeds, and on tight corners. The length of the steering arm, in relation to the spade/drop arm, effects the “speed” of the steering reaction. A long steering arm causes slow but very light steering, whereas a short arm causes quick steering but requires greater effort. As can be seen from the following image, there are two possible arrangements of the n shaped Yoke. It can be attached to the chassis, or it can be attached to the stub axle (recommended). It is recommended that you attach the “King Pin Post” to the chassis, and that the n shaped yoke is attached to the front stub axle. This will make it easier if you are installing brakes on the front wheels. It also provides for greater clearance for the steering arm. The problem with installing the n shaped Yoke on the chassis, is that when attempting to achieve “full steering lock” the steering arm hits off the n shaped Yoke. This was found on a previous kart and a notch had to be removed from the steering arm to allow for extra steering lock. This article describes how a Rotax Go-Kart with a 34hp two-stroke engine of a mere 125cc! can achieve 100mph!! Including the driver, the total weight of the kart comes to only 300 pounds (or 136kg), with dual disc brakes on the rear axle, and disc brakes on each front wheels. The Go-Kart has an amazing transmission. It has a 2 speed direct drivetrain which is chainless and shifts electronically via two large paddles mounted onto the steering wheel. There is an electric starter which can also move the kart in reverse!! Although this article was written in 2000, it contains some up-to-date details and information on the transmission and capability of an ATV (All Terrain Vehicle). Details on the “Hondamatic” transmission providing engine braking are included, along with Limited Slip Differential are included! This article is definitely for the off-road enthusiast. There are no exact details on the engine specs or the costs. There is also a hayes owners workshop manual available for this ATV. Perhaps some of the technology could be taken off one of these ATVs and transplanted into a Off-Road Kart.